A writer has railed against being 'overridden, patronised or ignored' by men on a daily basis in a lengthy Instagram post. 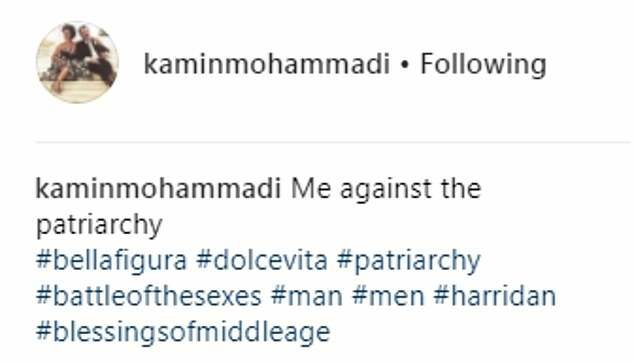 Iran-born author and journalist Kamin Mohammadi, 49, who moved to the UK with her family during the 1979 Iranian Revolution, described being forced to 'cringe into' her seat on a flight because of the 'manspreading' passenger next to her, following a similar experience at security which saw the 'men on either side use all the space'. Kamin, who said she was forced to poke the man next to her before he would make space for her, vented her frustration at 'the unquestioning right of men to take up all available space'. 'I notice this every day in every situation. How I am reduced into smaller spaces than I can fit in, how I am talked over, not listened to, told what to do, overridden, patronised or ignored or told I am crazy,' she wrote in her post on Monday. Despite women 'finally speaking out', she said in an apparent reference to the resurgence of feminism triggered by the Me Too movement, women shouldn't 'imagine that we are yet in anything other than a man's world'. The writer shared her post on Monday after being jostled by men on either side of her while going through security at an airport ahead of her flight, forcing her to take her open case and laptop to another table so she could repack her belongings. On the flight itself, while struggling to get her carry-on case into an overhead locker, three men and a male flight attendant told her to put it somewhere else, she said, adding 'no-one physically helps though'. And having finally taken her seat, the 'manspreading' - a term used to describe the male habit of sitting with their legs so far apart on public transport that it encroaches on fellow passengers' space - flyer next to her left her no room, refusing to shift until she poked him 'quite hard'. 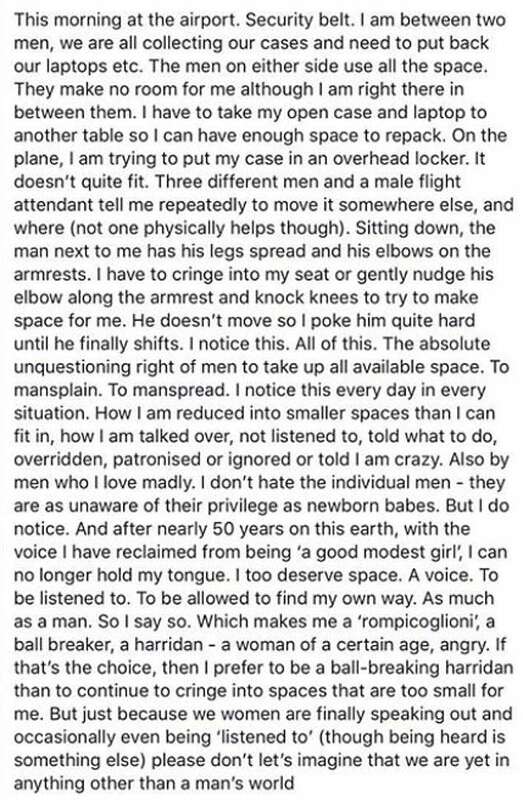 Kamin said she didn't blame individual men, who she described as being as 'unaware of their privilege as newborn babes', but said that she could 'no longer hold my tongue - I too deserve space'. The writer claimed speaking out would see her labelled a 'ball breaker' or 'harridan', but added 'I prefer to be a ball-breaking harridan than to continue to cringe into spaces that are too small for me'. Last November a man was thrown off a subway train in New York after punching a woman who accused him of manspreading. Sam Saia, 37, said at the time that she had politely asked the man to move his legs while she was sitting on the N train. She said he erupted into a violent rage; swearing at her, threatening her and punching her in the mouth. A fellow passenger intervened and the man was ejected from the train at the next stop. 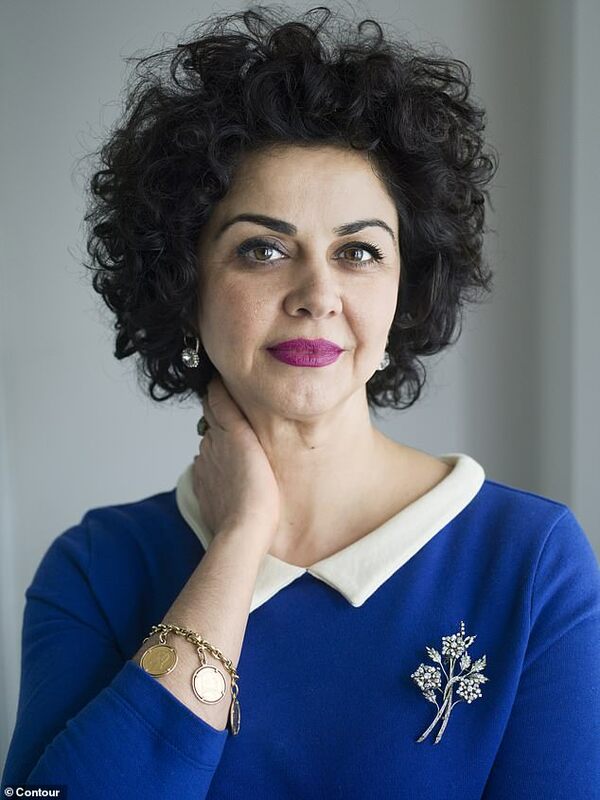 Kamin Mohammadi is the author of Bella Figura: How to Live, Love and Eat the Italian Way, and The Cypress Tree: A Love Letter to Iran. She also regularly guest presents on BBC Radio Four. 2 points: women seem to fail to take a male's anatomy into account and the real villains here are airlines' penchant for ever smaller seats. I was very attentive to a female passenger next to me, letting her have the armrest. Do you know what it's like to cross your arms for the entire flight and trying to compact my man's body? My shoulders and arms ached for hours after the flight. No one wrote about how nice I was.